Many of us who garden in the Pacific Northwest, and especially those of us in Portland this year, will be visiting our garden centers and favorite nurseries this spring and summer with a little more anxiety and need as we look for plants to replace those that have succumbed to this winter’s cold, ice and snow loads, all of which were more severe than what we have come to expect here. But before we pull on our boots and don our rain gear to head off for shopping there are several questions that we need to consider before we make our purchases. Not all of us draw up plant lists, but most of us at least carry in our heads a wish list of plants we have seen in other gardens, in magazine spreads and while on vacations, but if we want to avoid some major mistakes and move our gardens toward the kind of landscapes that we really want, we are going to have to put on our reality goggles and critically assess our choices…that is, if we want to avoid unnecessary losses in the future. In Portland we’ve just come through our coldest winter in over 20 years. While many of our records for daily cold temperatures date back into the 1940’s, 50’s and 60’s, 1950 being a particularly bad one, including -3ºF set on Feb. 2 of that year, we have just endured an overall, very cold period to date for us that in my memory rivals any winter we’ve had since 1989. In terms of snow and ice this has been up there with the worst of them. Well, people from the Midwest and the New England states might scoff and shake their head’s while they mumble something about how spoiled we are, or about how much worse it has been back ‘home’, for us, historically speaking, it has been a serious smack in the thermometer. While in my inner Southeast garden we did not drop below 17°F much of Portland and the surrounding area fell significantly lower. Areas west of the Tuallitan Hills like Hillsboro, more than once dropped into the single digits in January. Each of us, when we go out to replenish our gardens, will make a choice concerning how much of our gardens we’re willing to risk to winter’s cold. Some of us will make very conservative choices refusing any plant that isn’t hardy down to zone 6 or 7, more than a little excessive in my estimation. Other, less risk averse gardeners, will choose at least some of their plants from a pallet of zone 8 plants. The lunatic fringe, including me, will raise their lower limit to zone 9, and in a few special cases to 10, for some portion of their purchases, either risking their survival out right by planting them directly in the ground, knowing we’ll likely have to replace them again, or stewarding them along, protecting them from the cold, digging them or dividing them, to have a few plants held in reserve should/when those in the ground fail, but none of us would plant a whole garden of zone 9-10 plants…not here. That still leaves us with the other issue that occasionally confronts us, our plant’s structural strength and their ability to ‘weather’ the ice and snow with minimal damage. Gardening in the maritime Pacific Northwest presents a unique challenge. While our seasons are generally mild, when compared to the rest of the country, and our native soils, if not destroyed by grading and construction, are rich, promoting vigorous and in many cases lush, even excessive annual growth, especially if we add supplemental water in summer, our winter precipitation pattern can swing widely, during any given winter and from year to year. Our historically consistent winter drizzle can, in some years, deliver it in a series of downpours, or as freezing rain and heavy/wet snows that both cling to surfaces and weigh plants down. This is not the snow of continental areas of the country with their generally colder temperatures, this is our own particular decoction whipped up by our unique conditions here, given our latitude, our relative closeness to the Pacifc, our position at the head of the trough of the Willamette Valley and the mouth of the Columbia Gorge, that can serve to drain the cold interior of the continent when conditions are right. If this were a dice game, there would be several in play at each roll. So, these kinds of winter are going to occur occasionally, and with these events will come damage to our landscapes, some of which, maybe even most of which, is avoidable. Looking out our bedroom window the morning after at the near Chinese Windmill Palm to the left heavy with snow. Two other palms bend under snow while the neighbor’s Cherry was little effected. Just peaking out in front of it, past the roof, is my very upright growing Cornus kousa, its several competing leaders of which splayed out widely without snapping or splitting. There are reasons why some plants failed this winter and others didn’t. It wasn’t all random, nor is all such damage ‘inevitable’. Much of it is preventable, if that is our desire….Some of us don’t mind the occasional ‘excuse’ to rework our gardens, in fact some of us have learned to ‘embrace’ this, even going so far as removing mature trees and shrubs whether by transplanting them away and ‘gifting’ them to others or simply cutting them down and removing their stumps…but even then, we would like to do so when we choose to. We need to remember that all gardens and landscapes are dynamic and can be determinedly so, forcing our hand. There are three different characteristics of plants that we must keep in mind if we want to avoid or minimize the structural damage that we have seen all around Portland this winter. First, some plants are inherently structurally weak and will never be able to consistently holdup to the loads and stresses that this kind of winter can put on them…though this ‘structural weakness can also be created through accident and poor pruning as well. Second, in addition to their structure, the wood itself of some trees and shrubs is relatively weak, brittle or more subject to stress failure than another plant even with the same structure. The two work together and can combine to either moderate potential damage or exacerbate it. Many plants, with our active stewardship and care, with good cultural practices, primarily our pruning and ‘training’, can be better ‘prepared’ to tolerate these stresses than when left on their own. The third issue is that plants have natural relationships with other plants that are mutually beneficial to them as a community, most obviously those from woodland or forest communities. Every plant evolved under conditions that were common to them and, for the most part, are successful under them…but, push any plant too far beyond that and…it’s going to have problems. ‘Failure’ can also be in the eye of the beholder because a plant that suffers ‘relatively’ minor breakage is not a problem in nature…even occasional catastrophic failure is not necessarily a problem. In nature the problem is when plants can’t successfully reproduce over time. In nature problems become such when they become statistically significant, when they fail in the aggregate. For us, in our gardens, we are concerned with specifics and individuals. For us reproduction is not necessarily a problem because we often purchase and place our plants, we desire control in this way over their lives. When it happens we want it to be orderly and controllable. Different expectations. Even those of us attempting to create and foster a more natural landscape, may have aesthetic expectations that can get in our way and our impatience, pushes into action, into cleaning up, grooming and adjusting the garden. We too are a force in the garden, not so different than the others active in the landscape, if we are conscience of our role. All plants will fail at some point, often despite our best efforts. Trees do fail/fall in the woods and crush their neighbors. Shrubs, especially tall ones, can topple uprooting themselves in nature when the growing conditions ‘support’ this. We, often attempt to control and limit all of this randomness in our gardens. Now, having said this, many of us can make much better plant choices, choices that will reduce our own stress and better assure that our gardens will remain harmonious with our aesthetic over a longer period. Woody plants have a perennial structure, upon which they add additional growth each year, unless we choose to cut them down to force new replacement growth, a practice that suits some species better than others. In general, herbaceous perennials, replace their above ground structures with the onset of every new growing season. If they suffer damage, when the time comes they will replace it, as long as the plant is kept in a reasonably healthy state. Snow and ice, if herbaceous perennials have not already collapsed on their own at the end of their growing seasons, may crush them to the ground, like our acaulescent (stemless) Hellebores, but we would normally cut those back anyway to better reveal their coming blossoms, so it isn’t a significant loss. Other perennials possess an inherent flexibility that allow them to ‘spring’ back when the load melts away. There are woody plants that possess this characteristic as well, at least to a point, as long as the load isn’t too great cracking stems. Woody plants, possess height and breadth that they support above the ground on a structure of trunks, stems and branches lifting itself, arching, growing up and outward. The lower structure supports the upper growth in an unbroken pattern, literally tied together with lengthwise fibers and their bulky woody core. It is a very elegant solution to the physical ‘demands’ put upon our trees and shrubs. Like any structure they can fail and when they do it will be in predictable ways. The fibers themselves can separate, splitting a branch or trunk lengthwise resulting in the branch, still attached, drooping, twisting with the pattern of fibers or collapsed and hanging from its intact fibers. This is a relatively common occurrence as the fibers that cross and bond the lengthwise running fibers within woody plants are much shorter and lignin, the ‘glue’ between them can do only so much. And finally, another tree, still structurally intact, but with a root system unable to support the above ground structure, tears away from the earth, popping roots, and falling to the ground. We can see this all around us. When healthy woody structure is compromised in any way it is greatly weakened. Much of the damage caused under load won’t be catastrophic and may be ‘invisible’ to many of us especially to the untrained. Minor failures remain attached and can continue to grow. With its load removed it may not rebound. Such damaged branches can remain in a plant for years in their more collapsed position. Woody plants will attempt to strengthen a damaged branch or stem by adding new cambial growth in the form of additional woody rings when growth commences. But broke is broke. The tree will accommodate the damage, growing around it, if it can, to strengthen it. Some amount of rot will occur leaving a weakness within. Damage remains, eventually enclosed within newer growth, but there all the same, compromising structural integrity. All woody plants, when they add cambial growth, do so in response to the pull of gravity adding more to the underside of the branch, more to the leeward or leaning side of a tree’s trunk. Rings of even thickness occur under a consistent and evenly distributed load around the circumference. This is most often only the case with perfectly vertical stems and trunks, but even this growth will respond to wind and it will be uneven if the winds tend to blow in a particular direction. Branches will always be under load by gravity. Their lower surface, which is under more compression stress, produces thicker growth across this section of the ring. The upper surface, subject to tension forces, require less bulk to maintain their structural integrity, structural integrity is everything in understanding failure, and so is thinner, the lengthwise fibers being very resistant to such forces. Growth in woody plants occurs only at buds and all over the thin surface of the cambial ‘skin’ that covers its surface. This is why as trees age their branches seem to ‘lower’. In reality they are adding more bulk to the underside of the branch. When branches are attached low on the trunk this can result in significant physical and visual ‘barriers’ for pedestrians. Two of my neighbors conifers, a narrow form of Pinus strobus, Eastern White Pine, on the left, the longer lower branches heavily weighted down, several of which broke. The Spruce on the right with its sweeping branchlets spills much of its snow load. That’s the top of my 20 year old Autumn Brilliance Serviceberry at the bottom of the frame, unfazed as expected. The take away from this is that, structurally, vertical growth is ‘stronger’ than unsupported horizontal growth. Gravity is less likely to pull anything down if it is plumb, vertical to the ground. A vertical stem, a strong central leader, as is typical with those conifers that are commonly harvested for lumber (many other conifers have inherent structural weaknesses), have the bulk of their mass in the column that is their trunk. Horizontal branching is heavily influenced by gravity and while woody plants have evolved a strategy to strengthen themselves against this, as I described above, it is still an issue, and when weather conditions add weight to those branches, gravity’s effect is increased and branches can fail. I’m not going to go into the unique structure of these attachment ‘points’, suffice it to say that woody plants have evolved a strategy that reinforces these, but never-the-less, these are stress points in any tree or shrub. The overall form of the plant, its branching habit, their length and arrangement on the trunk, their angle of attachment and a plant’s tendency to form multiple, more than one, leaders, trunks or stems, all effect their ability to withstand the leverage that snow, ice and wind places on them. This younger Ginkgo is approaching 20 years old and show what is typical branch attachments for these trees, broad and strong. These can greatly increase their diameter over time and several on this tree need removal before they come into conflict with the street or with pedestrians, the lowest here is only about 4′ up the trunk. This cultivar has closer and more regular branching than is common on seed grown plants, which can be quite gawky over a long youth period. I would remove some of these to reduce stress on the trunk. Sticking with conifers…this is a very large and broad group and include most every size, and many of the plant forms, that occur in nature, from prostrate ground covers to the largest and tallest organisms on the planet, so you cannot say definitively that conifers will always be a good choice here. Ginkgo biloba, when I went to school, was still classed with the conifers, though it is now in its own unique group of one. It had been considered a broad-leafed conifer. The designation, conifer, refers to their seeds, which typically form ‘naked’, without the covering fruit, inside a ‘cone’ structure. There are many atypical species, exceptions, in nature and in our effort to make sense of them we sort them focusing on their individual features, at least until now when we parse using DNA. The Ginkgo’s fleshy seed covering, is not the classical ‘fruit’, ‘so, what to do what to do’? Ginkgo do share, with many conifers, a strong tendency to form a dominant central leader with subordinate branches below. They have the strength and structure to be good performers here given even these irregular storms. It is rare that I’ve seen one succumb this way, assuming of course that they have not been compromised by us or an adjacent tree’s failure. Pines, in terms of strength, are often a different case and can vary widely. Many here don’t always fair so well. Many have branches that don’t caliper up enough, don’t thicken, to provide sufficient strength to withstand snow and ice loads. Shore Pine, a coastal native, is one of these. Branches frequently fail, their lengthwise running fibers separating near their attachment points, dropping into positions where lower branches now must carry part of their ‘load’. This is common. These failed branches still grow, but disturb the trees more elegant form. Removing them, which I’ve done, helps them aesthetically but does nothing to assure the healthy survival of other branches above which can now droop even lower when they fail. I looked in vain for a few good pictures of Pines in Japan that illustrate a particular practice. Pines, especially Japanese Black, Pinus thunbergii, are highly venerated there. I once read an article about their care on temple grounds, at shrines, that was illustrated with photos showing such pines that, come winter, gardeners went out and elegantly placed supporting poles beneath branches, always conscious of how these ‘lines’ contributed to the overall aesthetic, to carry some of the expected, damaging load. Maybe it was in only one garden, but there the crew erected structures, almost circus tent like and beautiful themselves, with an an array of ropes swirling down from tall poles, attached to limbs to support them. They looked like elegant sculptures. The cost was becoming increasingly extravagant, but they felt duty bound to do this. There are many conifers that share a different branching habit and form that can include many large and small very upright branches often growing relatively close to the main trunk sometimes forming several tightly growing leaders. This combined with the density of their foliage provides a lot of surface area for ice and snow. It is relatively common to see these fail and tear down leaving huge wounds and ‘holes’ in the plant’s otherwise tight compact form. Think of plants like the bluish, still common, Boulevard Cypress, and its many cousins. There are also many conifers with strong central leaders, good, with less tendency to form so many competing leaders, that can have many of their small branchlets bend down and sometimes tear giving an unkempt appearance to an otherwise neat and tidy compact and narrow conifer. These are like our ubiquitous Arbor Vitae, some of the columnar Junipers and other tight forms like Italian Cypress. Things to think about. Not all branch failures are catastrophic, but they can compromise the aesthetics of a plant. Some of these can be minimized by unobtrusive ties, belly wraps, around the plant to give them added resistance to being pulled down. This Boulevard Cypress failed in two stages, first the major split rent the trunk weakening the entire structure. The larger trunk, attached to the lower cut, split and fell later. The darkened tissue at the top of the long tear, had been open for some time before ultimately collapsing, it shows included bark and staining, which indicates that there was a weak attachment to the trunk at this point. Deodar Cedar tend to grow with a single leader like this one, but it is not uncommon for them to develop competing leaders. These tend to be broad heavily branched growers that commonly lose large branches and suffer huge tear outs from lost leaders. This one lost two 8″+ diameter limbs in the recent snow dropping 15′-20′ to the sidewalk. These are a fast growing conifer, a reason they are often planted and another reason their wood is relatively weak. Anyone who has ever used a lever knows that the height of a stem or trunk, the length of its branches, will multiply the effect of any load. Simply standing upright seems easy enough. Increase the force of wind and you will find yourself leaning into it to counteract its force. A tree and shrub is a lever exerting a force across it’s entire length and is maximized at its fulcrum point at the ground. A strong successful plant will dissipate this force through flexing its structure or ‘spilling’ it through the movement of its branches, the flutter of its leaves in wind. Without doing this all the force will focus at its base at the surface of the earth, its fulcrum. Force is commonly measured in foot/pounds. Increasing either one, the length of the lever or the forces on it, has a multiplier effect. One pound added to a one foot branch/lever exerts one foot/pound (ft·lbf). One pound on a ten foot branch/lever is ten ft·lbf. Because foliage tends to concentrate out at the branches ends that is where the snow and ice concentrates. 10 lbs of wet snow on the end of a 10 ft branch will exert 100ft·lbf of force at its point of attachment to the trunk. Tall trees, like Douglas Fir, exert greater forces to their anchorage in the earth, which is why they evolved in communities, woodlands and forests….Out of their communities, exposed, they receive no shelter from a community and must withstand the considerable and sometimes overwhelming forces with a root system never intended to take them. F=MA. Force equals mass times acceleration. A large Douglas Fir, with its living water weight, is a huge mass, move it even slight and tremendous forces are produced, tearing and crushing forces. Leverage works in all trees. An 90’ tall Elm with a 1000lb limb snaking 50’ out horizontally creates tremendous forces on its own, even without the addition of wind, snow or ice. Many species have limbs that have formed curving structures that create twisting/torsional forces along their length and at their points of attachment, that can split and tear them. My point is that wind and gravity can exert overwhelming forces especially in a compromised weakened structure. A Shore Pine toppled next to the Fred Meyers corporate offices with very little root space between the building and a broad sidewalk. The Pine’s stump heaved the surrounding ground up lifting this section of wall and damaging it. Woody plants all have genetic tendencies that determine much of the overall structure of the plant. Trees also produce auxins, hormones, from the terminal buds of their leaders and branches that have a varying ability to suppress growth that occurs ‘below’ them resulting in a range of vigor from completely suppressed to strong. These two factors largely determine a species overall shape and form. Plants with the strongest apical dominance will be plants like Douglas Fir whose whorls of branches will never compete with the leader and in fact tend to be shed over time as a tree grows taller and increases its girth. The largest branches will be many times smaller in diameter than the trunk, unless the tree losses its top through storm or some kind of accidental or man caused damage. Woody plants range from this form all the way down to suckering shrubs that sprout every spring with many vigorous shoots and prostrate ground covers like Kinnickinnic. Many tree species have heavy branching, sometimes with broad angles of attachment, strong, others with acute, more upright angles, weak. Some trees, like like many Cherries, have a structure in which no one branch is dominant and grow in competition with each other forming an upright broad vase shape. Other trees, like Hawthorn and Crabapples tend to be very brushy with no branches exhibiting much dominance at all. The weakest trees, structurally speaking, are those with acute angles of attachment, a congested branch habit with fast growth rates. Leaves greatly increase the surface area of a plant, surfaces needed for photosynthesis during active growth periods, that unfortunately provide surface upon which ice and snow can accumulate on evergreen plants. They also increase the sail effect, drag, when the wind is blowing which can compound the stress already provided by snow and/or ice and increase their odds of toppling in the winter wet softened soil. Plants that are cold deciduous have reduced surface area reducing the likelihood that snow and ice will accumulate to the point of branch or other failures…it doesn’t eliminate them as other factors are still present. Evergreen plants are poised to take advantage of positive growing conditions whenever they occur, through out the year, without the energy expenditure of first having to produce leaves. They have evolved strategies to retain their leaves over periods that are not conducive to active growth. Many temperate evergreen plants dominate in areas that don’t have consistently moist summers, like the NW, which contain some of the largest conifer forests in the world. Others come from summer wet areas with relatively mild winters, think of larger leafed broadleaf evergreens like Rhododendrons. While many evergreens are tolerant of cold temperatures, as regions become colder they have a smaller proportion of evergreen plants and those that remain tend to have smaller and more rigid leaves. The ‘perfect storm’ in terms of maximum damage to a plant occurs on broad leafed evergreens with large leaves and weak branching in climates prone to freezing rain and wet snows like ours. A survey of Southern Magnolia plantings here would be very sad indeed. Were they able to shed them, as cold deciduous plants do, their ‘exposure’ would be minimal. This is a typical, though locally rare, Prunus serrulata, in that it hasn’t been heavily headed back with branches misdirected and congested. This is how it is genetically driven to grow. They require a lot of space. Nurseries propagate these by grafting them at 4′-5′ atop a straight trunk. The trunk will not grow taller. It will only caliper up as this one has. The two grafted plants attempt to grow at their own genetically determined rates. A typical Portland Cherry, Prunus serrulata. There are thousands of these in Portland including the many Kwanzan, Akebono and Fuji Cherries. Other Cherries, like the Yoshino, planted in north Waterfront Park have a similar broad ‘vee’ structure Every branch here has been stubbed off…twice. You can see where each cut has been made with its resultant sprouts, giving it a ‘brush’ appearance. These trees are typically grafted at 4 or more feet above ground. The graft union is prominent at the top of the trunk. A gangly Prunus serrulata. It has the typical broadly open vase form of the named cultivars with most of the main branches removed. Heading cuts result in jarring ‘dog-legs’. This tree has had its many twiggy shoots removed. Without followup care these can get congested very quickly. A neighbor’s now dead Blireiana Plum abused, neglected and unwatered for many years. I feel like I have to say something about this genus with regards to their structure, strength, longevity and the frequency of their use here in Portland. This is a large genus containing many popular ornamental as well as edible species and cultivars. In Japan, some of these play a huge part in the culture of their people and there is a ‘spill over effect’ here. Grown at their best many of these are truly beautiful in bud and bloom on what can be a broad elegant and open vase like structure…but grown poorly…. This genus contains many different forms of woody plants varying from suckering shrubs to the somewhat congested large older varieties of edible Cherries, few of which are planted in landscapes today, to evergreen trees like English Laurel, to the brittle and deciduous Prunus padus,. None of these have a strong central leader structure. Most of the more commonly used trees have a more congested, even twiggy, structure, while the most common Flowering Cherries of asia have the more classic open vase form, many of which are grafted on rootstocks more ‘durable’ in our climate and soils. Some are top grafted 3′-5′ up on another plant’s trunk giving it a characteristic form. Most of the Japanese Flowering Cherries need attentive and regular work, work they too often don’t get from homeowners. Many are somewhat problematic here given our growing conditions, especially our heavier wet soils in winter and as lawn trees in regularly irrigated turf. Several are very susceptible to different blights that can result in necrotic, dead, tissue and rot, weakening their structure and decreasing their longevity. Too often these are planted by homeowners because they are pretty and relatively small, in inadequate spaces, little front yards and parking strips. Their broad vase shaped habit can create ‘conflicts’ with pedestrians and cars resulting in their branches being headed back, lopped off abruptly or broken by pedestrians and curbside vehicles which leads to several problems. The first is aesthetic. New growth juts off at odd angles destroying the tree’s natural grace and may release many previously dormant vegetative buds to grow, creating a brushy mess of vertical sprouts. Often times such pruning results later in visually jarring ‘doglegs’ and rot throughout the structure due to the large wounds created by such treatment. Many of these possess relatively strong tough wood, but anything can be compromised. Plums suffer the same treatment though their inherent structure is more ‘random’ in habit with acute branch angles, than these Cherries’ normal, more structured, growth. The point is that this heavy handed pruning and damage hastens these trees toward their demise and severely compromises the reasons most people plant them. My neighborhood has hundreds of compromised Cherries and Plums their owners often leaving them in damaged states even after they’ve died in too many cases. Birch trees of various species have long been popular here as landscape and street trees. Most tend to be found naturally in mid-cold temperate and even arctic North America, with exception of Betula nigra whose natural range is the American SE. Only one, Betula occidentalis, naturally occurs in any numbers in the Intermountain West of the US. The commonly planted Paper Birch, Betual papyrifera, is a resident of cold temperate and arctic North America from the northeastern US across Canada to Alaska in the west, just dropping down into northern Washington. Betula pendula, the European Birch, covers a region similar in character across Europe and northern Asia. These are cold acclimated trees that occupy much area that is considered climatically, continental. These areas can have very cold winters often with colder/drier snow. They do not grow the strongest wood and while many do tend to grow a central leader, they do not do this strongly and often have upward growing branches. Most of these tend to suffer periodic breakage in the Portland area and as moderate – large growing trees have often been cut back hard in misguided attempts to limit them and maybe even prevent damage from dropping limbs or for power line clearance. Birch in general don’t respond well to physical damage and heavy heading back cuts. They don’t close wounds as well as many other species and because of this are subject to extensive and damaging rot, again that greatly compromises the tree’s structural integrity and its resistance to further damage. Be wary of planting out Birch especially in exposed sites and those instances where you anticipate having to prune these to contain their growth. There are less visually significant factors at work as well, but these require more familiarity with the various species. Here I’m referring to the strength of the wood itself. Its ability to withstand compression, tension, torsion and shear forces. When it comes to strength, not all plants are created equal. The strength of a plant’s woody structure determines how, where and how much load it will take to break it. Within any given species this strength will vary across a range. Some species tend to be brittle, they possess relatively little internal strength and will break predictably under loads that would do no damage at all to another species. This strength varies even among the species within a particular genus. It is, however, safe to broadly assume that most members of a genus will lie within a relatively narrow range of strength, that is,they will likely vary less than two species from two different genus may. Many of the Magnolia tend to be somewhat weak wooded so be aware of this when you choose your particular tree and look for one with stronger structure, site it in a more protected spot and keep your pruners available to develop a stronger structure over time. Is that suitably murky enough? You don’t need to know what species this is to know that it is seriously compromised as a structure. Planted beneath over head power lines years ago it has had much of its top growth removed repeatedly. I would expect to find extensive rot in the remaining structure. Arborist will talk about a technique called crown reduction, but this is the result of gross utility line clearance w/o any regard for the beauty of structure of the tree. Given it’s compromised and the fact that it’s still standing, this tree has very strong wood. It will fail catastrophically at some point. Strength is also related to rate of growth. Fast growing species, especially those that push 1 1/2’-3′ or more of shoot growth from their active vegetative buds once they are established, tend to have ‘weak’ wood. Conversely, slow growing trees tend to have stronger and denser wood. Genus Populus, Salix and Alnus, tend to have less dense and weaker wood. Maples vary in the strength of their wood and the speed of their growth with fast growing species like Silver Maple very weak and prone to failure, so be wary. Oaks, genus Quercus, have a reputation for strength. It is well earned. Even some of the faster growing species like Q. rubra and Q. coccinea are relatively strong when compared to many species in other genus. Q. palustris, the Pin Oak, another fast grower, is strong as well, but all of these quickly become too large for the home or street use. You should keep in mind though that even an Oak with its ‘strong’ wood, can have a weak structure that will put it at risk of failure. Ornamental Pears like the commonly used Bradford, a cultivar of Pyrus callaryana, were selected for their narrow oval growth habit to be used in narrow spaces and as a street tree. These have been planted in countless locations around the City and all invariably, as they mature, because they are fast growing with limbs that quickly gain length and weight, begin to lean out becoming more vulnerable to damage from wind, snow and ice, also given their more acute branch angels of attachment. For Pears, it is not ‘if’ they will fail, but a matter only of ‘when’. The driver in the stopping car got out and helped me pull this out of the road. Rate of growth is not always an accurate indicator, but it is a very good place to start. Some fast growers like the Tulip Tree, Liriodendron tulipifera, seem to do very well here in our winters. When it comes to trees it is not just strength we should consider. Anyone who works with steel and structural metals knows that flexibility must also be taken into account, the ability to ‘give’ and then rebound when stress is removed. Watch a large tree like the Liriodendron in heavy wind and you will see it sway and flex. Strength and rigidity are not the same thing. This ability to move dissipates the energy spreading it throughout the structure. This point emphasizes the importance of a healthy structure, one that has not been hampered by injury from previous storms or by some tree hack butchering it. Wounds, rot and an unnatural form prevent the tree from moving as it should. These create weak spots often ‘focusing’ stresses even more at these points, putting it at risk for greater injury. Trees, like other life forms, have an internal and structural integrity that allow them to perform optimally. Damaging this will compromise a woody plant’s ability to withstand the forces working to bring it down. You have no idea how upsetting this photo is to me! This ‘was’ the 4th St. garden at City Hall I took care of for 15 years. My successor did not do this hack job. When I talked to the building security staff I was told about the storm damage that had to be cleaned up…the same man assured me that it would come back. He clearly doesn’t know what he’s talking about. They had someone else come. Normally this is a Park’s responsibility. The 20′ tall Azara microphylla, to the right, clearly had a major failure, but they stripped every thing off. They cut a mature Viburnum ‘Onadaga’ to the ground, along with the lovely clumping bamboo, Borinda angustissima. God knows why they lollipopped the Western Red Cedar. The 15′ Magnolia grandiflora ‘Little Gem’ was roughly stripped as well leaving an intact top knot. WTF!!! The Roses along the perimeter wall and a Cardiocrinum hookerianum to the far left in the picture by the wall, were the only woody plants left undamaged by the ‘cleanup’. Rate of growth is effected by DNA, a plants state of health and the conditions it finds itself living under. Just as plants can be stunted or die when the conditions are too much less than those that are optimal, if they are ‘too’ good and growth is ‘forced’ the resultant rapid growth may be lush and ‘weak’. Forcing a plant with rich soils, fertilizers and water can do this. Providing unnatural physical support in the form of excessive staking can do this as well. What is optimal for a plant is related to those conditions that they are adapted to, that they evolved with. Sometimes by simply planting a tree or shrub in our gardens the conditions are such that a plant will grow with too great of vigor this is especially true of plants adapted to poor soils and harsh, relatively short growing seasons, like many desert residents, alpines and plants adapted to mineral soils. Many of the shrubs I’ve planted over the years suffer this way growing faster and larger than it would under ‘normal’ conditions. These plants flop and are weak wooded and/or have top growth that is out of balance with their roots and subject to toppling, uprooting themselves. Sometimes in our rush to have a full sized specimen we are dooming a plant to a shorter life as it grows beyond its own internal limits. Many plants can thus suffer from our dutiful care. We need to ‘temper’ our enthusiasm. Any tree can be compromised and greatly weakened by improper care including staking and pruning. Educate yourself or higher certified professional help. Learn to look at tree structure when you are out for walks. Each species and cultivar tends to have a natural form that maximizes its strength, though many cultivars are chosen for characteristics that either weaken them directly or simply favor some ornamental feature over strength and structure. Such cultivars are anomalies and are then atypical. Plants, trees, each follow a pattern of growth that is unique to it. Organic growth is incremental and fractal, a build up of simple patterns that gives a plant an inherent grace, if damage free. If damaged, if it can, a tree will attempt to recover by continuing this same pattern, though obviously the damage will remain. When you observe a healthy tree you can see these patterns. When pruning is called for for structural reasons, to correct damage, you keep these patterns in mind when you select and make your cuts. Your cuts should augment/support the trees natural form. Sometimes damage is so extensive that this may seem impossible, but the goal is still to protect the inherent grace and strength of the tree. 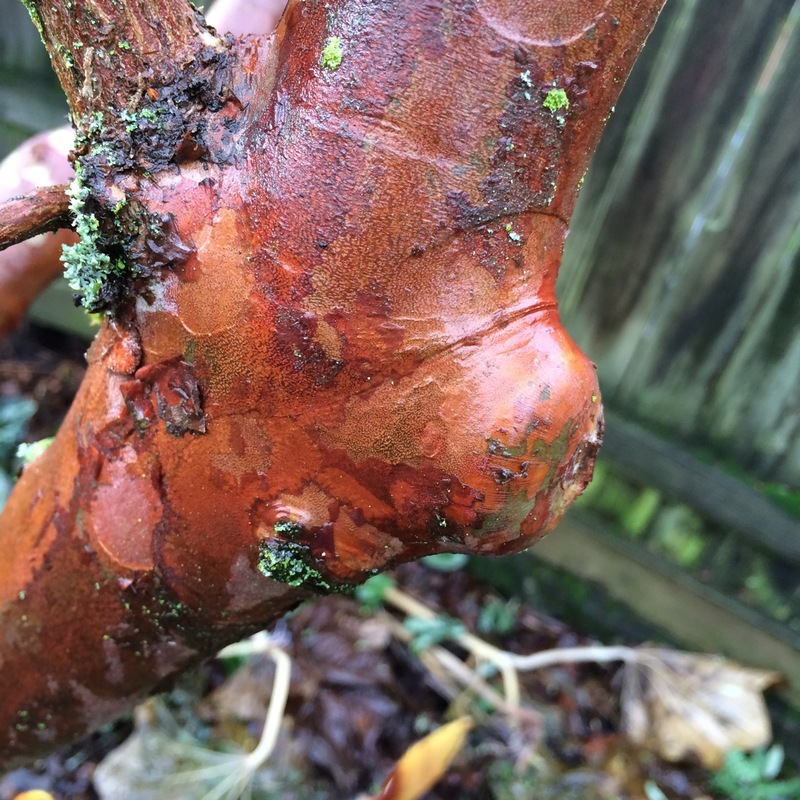 The knob to the right is a calloused over pruning wound on my Stewartia monadelpha. The callous tissue here looks like the other bark not always the case on most trees. The bark is thin and exfoliates but the old ridge still remains at the base of the removed branch. A good cut is not flush to the trunk and the tree is able to grow over and cover the wound fairly quickly. Learn how to make good cuts. Learn your trees. It is possible to prune a tree without knowing its particular name, as long as you pay attention to its form and patterns of growth. Like other aspects of horticulture it is ‘art’ and science. A strong naturally formed tree can, as I wrote above, transfer and carry forces throughout the tree and help protect it from additional damage. Stubbing back limbs and branches because you simply think it’s too tall or wide, violates this pattern and creates unnecessary stress points where the tree will fail in addition to opening the tree up to rot for longer than might otherwise be necessary. If you’re growing a hedge a lot of the cultural practices that promote good structure can be thrown out. A well grown hedge gets routine pruning, some requiring it more than a once annual shearing. This repeated cutting back promotes short/sturdy branching making them somewhat more resistant to snow and ice damage. Having said that, some species will make sturdier hedges than others. A smaller growing species may be too weak and so be subject to splaying open, its dense foliage shell presents a lot of surface area. A fast growing hedge, such as English Laurel and Photinia, that are naturally trees, can grow with such vigor that their pruning needs are burdensome, their trade off for strength. Good hedge plants are such in part because they can take repeated heavy cutting back and because their interior structure is not on display, such treatment doesn’t matter. Hedging will create a relatively thin and dense ‘shell’ of foliage at its edge so if it is cut hard to reduce its size or to help it recover from damage it interior ‘twiggy’ structure will be on display until it recovers. If you visit many natural landscapes in the world you will see what exposure does to plants. As the severity of growing conditions increases the size of the plants tends to shrink and become more compact. Storm beaten coastlines ‘train’ their trees into huddled wind swept forms or break them. Plants of the alpine, steppe and tundra regions of the world do as well, or cause them to evolve into more compact/cushion forms, in a proven strategy to protect themselves. The same goes for those areas where landscapes transition to desert. Urban conditions in general are some of the harshest in the world. While we can plant a great many species here in PNW we need to keep in mind that our landscapes can be subject to storms, that will bring us back to reality…it all depends on how much we are willing to pay out after such events. If we want to save on replacement and pruning costs, we should be paying attention to this, especially regarding our tree choices, because to have a storm inflict this kind of damage on our urban forest every 10-20-30 years is significant. If our trees are more disposable, like so much else in our lives, it doesn’t matter much. All plants originated in particular plant communities. They grew in relationships with diverse species. Sometimes these relationships were direct and involved a sharing of their metabolic or growth, processes, such as various fungal and bacterial associations, but also between vascular plants like the trees and shrubs themselves forming root grafts or connecting via third party associations utilizing fungal hyphae. Other times these have to do more with light and shade or protection from wind and the elements, while others effected soil hydration/saturation, protecting a plant from a too soggy root zone. When we plant our gardens we need to keep these in mind. We are creating communities and they should have the ability to form the supportive relationships they evolved with. Regarding structural winter damage, I am reminded of woodlander plants with the overarching tree canopies that serve to protect smaller species from the full force of the weather not just the sun’s intensity. Trees themselves, unless they are the occasional residents of grasslands and savannah, receive a great deal of protection from their other forest neighbors protecting them from wind, ice and snow, rather than having each withstand them on their own. We should remember that those trees that do grow on their own, in the open, tend to grow slower and stockier, retaining heavier limbs closer to the ground, stronger than those growing in either a protected forest community or forced along, nurtured and protected in nursery rows. We can see this when we drive through the Willamette Valley and see venerable solitary Oregon White Oaks standing on hilltops and compare them to those growing in tight little groves down in draws. Our gardens and urban landscapes are contrived presenting conditions that may be very different than those that many of our chosen plants evolved with. Many of us carry in our heads an idealized version of nature, woodland and forest scenes with beautifully spaced trees, often of mixed species, their high canopies topping a wondrous understory plant community…and we have this in mind when we plant and care for our own landscapes…but natural areas are very different in makeup and evolved over much longer time periods than our own yards. In a sense there is nothing ‘ideal’ or idyllic about a forest. They are a riot of life and death. Countless trees germinate, beginning their lives and die before ever maturing. Lack of light, water or nutrients, periodic fires sweeping through cleaning away the carbon bulk of their remains. The ‘snapshot’ the slice of time that we may ‘picture’ is actually a long term selection process that follows aeons old patterns, not some nature, designed on paper, from a palette of plants limited by human imagination and market availability. ‘Our’ trees and shrubs don’t face that kind of environment. In our landscapes we determine largely what lives and dies and we often nurse plants along that would have never survived in nature. Their placement, their form, are largely under our control. Our continued participation in their growth is essential if we wish them to be healthy and strong, if they are to fit into our aesthetic. When we plant a tree in a given light situation and it is forced to contort itself to reach the sun, when we plant a tree from a nursery field, or damage it inadvertently or ‘inherit’ one hacked into compliance by some well meaning but ignorant predecessor, we have to respond in a way that can compensate for the damage, or that tree will be more likely to fail. Our desires count for very little if poor choices were made before us or if we continue to make uninformed ones. Nature does take care of itself, and in the process, sacrifices much. We have changed so many forces, so many of the site conditions in our landscapes, that there is no ready natural pattern for nature to follow. It is disrupted…we disrupt it, every time we go out and work. All that we can do is choose to what degree we will participate, what kind of gardeners we will be. Whether we will be careful observers or not. Across the street from the Justice Center is Chapman Square and this now decimated bed, the victim of a massive limb failure from high in a nearby Elm, something that mature Elms are prone to do here, though it can happen at anytime of year. It stripped several of the branches from the Gingko here. In the same bed at Chapman Square this softwooded Daphne tangutica was splayed out by the snow with the fallen Elm branch adding to the insult. Not the best picture, I was probably shaking, as I observed almost every plant in this bed that I planted several years ago heavily damaged from Mahonia gracillipes to Rhododendron yakushimanum to the beautiful and rare bamboo, Phyllostachys bambusoides ‘Richard Haubrich’ . Debris from the dropped Elm limb remains broken on the ground. We need to remember that our woodland shrubs and smaller understory trees are just that, part of a native understory and so, in a way, very dependent on the canopy they evolved with. When we plant these out in our gardens we need to remember that now they are often without the protective canopy that can intercept and catch some of the snow and ice that would otherwise make first contact on them, placing a burden on them they may be ill equipped to handle. They may grow with more vigor in your garden having less competition for water and nutrients. Of course, in a forest or woodland, the understory would still be subject to even devastating damage by the occasional falling tree branch from above. Nature is inherently messy. Every available option contains risk. Every species was once a member of a natural plant community. An Alpine meadow in the Cascades, the South African Fynbos, Germany’s remnants of its Black Forest, the California Chaparral, the Steppes of much of central/continental Asia, they contain a particular plant communities, with all of the relationships worked out, until we break them. At that point our participation becomes essential. If we ‘borrow’ plants from other regions then we need to do our best to mimic their growing conditions if we want them to be strong and healthy. We need to keep our climatic patterns in mind and be willing to step up when weather extremes visit. We do this through plant choice, we do this by educating ourselves about the plants we grow, how they respond to stress and what we need to do to help them…or to be willing to accept their failures, our failures. A dominant or strong central leader. Whorl branched conifers such as Firs, Spruce, Hemlock tend to be very strong. Pine’s less so. Pay attention to a Pine’s regional conditions of their origin. Many Pines, like Shore Pine are very prone to branch collapse under load. Horizontal branching. Avoid trees that produce many long upright growing branches especially those with multiple leaders which are inherently weaker. Relatively little damage/rot, both of these disturb a tree’s overall structural integrity and thus, its ability to withstand loads. Has a deep and broad soil volume available to it for health growth and anchorage. Growing in a plant community that supports its health and structure, because plants are communal organisms and reliant on their relationships with one another. This 12′ Mahonia x media ‘Charity’ grows in an upright ‘vee’ shape. It has smallish evergreen leaves, its tendency to retain leaves for several years, creates a densely leafed structure that creates a lot of surface area for snow and ice to stick to. This plant did spread and open up from the load, but the toughness of the wood prevented it from breaking. Any kind of of canopy would help by intercepting ice and snow. Strong/flexible wood, not brittle, some are quite ‘soft’ and don’t spring back from being crushed, broken or not. Many of these stand because of their overall supportive structure, each small branch supporting others, so once down…. Many shrubs, if heavily damaged, can be cut to the ground and rejuvenated. Shrubs with a more structural form can be routinely pruned to reduce the possibility of breakage, shortening and reducing the bulk of the branch structure and foliage surface such as Camellias and larger growing Rhododendrons. Choose shrubs with deciduous or small evergreen leaves. Many shrubs can be selectively cut back or sheared shortening their branches and reducing the chance of either flopping open or breakage. This can result in a stiffer blocky appearance. Shrubs tend to be shorter lived than trees and some replacement should be expected. Flexibility and stem toughness to withstand the weight. Due to their low stature the ground itself protects many of these from load damage. When choosing a plant evaluate it by the appropriate characteristics above keeping in mind other criteria to successfully grow these on your site. Remember too when you select a particular plant at the nursery that it has good structure now, that it has not been treated by the grower or nursery staff in a way that will later compromises it as a mature plant. We are often tempted by bargains and discounted plants on sale or from the bargain bench, but be careful! A compromised plant may seem to be a bargain, until its early death or failure wipes away all of your ‘savings’ on it. Your plants’ should be well branched. They should not have been held too long in a small pot. Knock it out of the pot and examine the roots! Circling woody roots will never straighten, if you don’t ‘tease’ them out and may in fact ‘girdle’ your plant or limit the spread of its roots in a way that will cause an instability in the ground leading to its toppling over as its anchorage is inadequate. Check the root ‘flare’ at the base of the trunk to make sure the plant was not planted too deep. If it is too deep the trunk will extend in a straight below the soil line, no flare. (Girdling roots will disturb an even root flare from forming in in the section where a girdling root limits their spread). This is especially important when buying larger plants, bxb and boxed specimen. Assure this also when they are planted out. If your plant is tightly staked along the length of its trunk at the nursery understand that when you plant it out, it will still require staking, because it has been weakened, but restake it more loosely, using soft materials like the commercially available tree-chain or Tre-Lok, so that you don’t damage the cambium, only stake it as high as 1/3 of its total height, because trees need to move to be strong. When staking don’t use steel fence posts, or if you do, remove the ‘wing’ before you install. Steel posts need to be removed and the wing will make that impossible or difficult without causing significant damage to roots. Should your plant die or need to be removed the steel post will make that more difficult and can damage a contractor’s stump grinder. Probably the single most important factor in the healthy survival of your tree or shrub, if you have done the above, is to to give it adequate space so that you are not in a perpetual battle with it to keep it confined to the space you have allotted to it. Any plant so treated, with the exception of a sheared hedge, will ultimately be compromised and sooner or later, probably sooner, it too will fail. Before it does the natural form and grace of the plant will have been destroyed and much of its aesthetic raison d’être will have been lost. Of, course, the plants should fit into your overall design and theme as well. Design decisions can obviate one or more of the strength criteria above. You need to decide how important it is to you. Keep in mind that there are thousands of plants to choose from, if you are not in a hurry and are willing to search them out. If you decide you really want a Silk Tree, Albizzia julibrissan, then get one, just be aware, that they don’t have a strong central leader, have a broad vase shape, grow relatively quickly and are prone to damage as they have relatively weak, brittle wood. They are deciduous so that is in their favor. Many trees will have issues, you should at least try to avoid the worst ones. While not actually ‘woody’, bamboos are monocots in the large Grass family, this Chusquea culeou ‘Caña Prieta’, from South America will rebound back from almost anything. Like all bamboos the culms possess very high tensile strength being both high in silica and with sturdy fibers running the length of them. This is the north side of Jefferson Circle downtown, the bamboo ‘hedge’ is Fargesia sp. ‘Jiuzhaigou’ IV and like others suffered no damage from our snows nor the ice that typically can hit downtown. To the left is Magnolia laevifolia ‘Large Form’. All of these seem to be tough sturdy trees with only a few that I’ve heard about suffering significant damage. Typically M. grandiflora, even its dwarf forms, were hit hard all over the region. I do like Pittosporum and this P. tobira ‘Variegata’ was already leaning and open before the snow though it is more emphasized now. Once such a plant starts to lean and splay out gravity will magnify any load put on it, causing increasing damage. This one could be pruned back somewhat to encourage regrowth to move its center of mass more over its roots. Not a woody plant at all, I just wanted to show these two healthy and sturdy Rhodocoma capensis, each over 4′ tall, having withstood the snow. Trachycarpus wagnerianus, with its stiffer and smaller diameter fronds stood up to the snow without a problem or any lasting impact. Splayed out is a Pittosporum tenuifolium ‘Irene Patterson’ with its beautiful, wavy, variegated and relatively small leaves…unfortunately splayed out wide by the snow. This is a common hedge plant in California and typically grows relatively fast with small diameter stems all combining to make this result expected. It could have been tied with a ‘belly wrap’ to support it or been cut back to reduce its height and its tendency to splay. This can be cut hard and they will recover. The palm is Trachycarpus takil, hardy here and pretty much immune to snow damage here. This shot show a palm, Butia x Jubea, to the left which is structurally undamaged by the snow. We’ll have to wait until later to see if it suffered any significant cold damage. The Cordyline australis ‘Torbay Dazzler’ is part of my original planting and has suffered some damage in past winters, not the las two. It is listed as a Zn 9a plant good to down to 25ºF, this is the first time it dropped below that, but I really don’t know how cold this site got. The Choysia ‘Sundance’ to the right appears to be undamaged by cold or snow weight. The historic cold snap in early February ’89 was much more severe and decimated Choysia ternate all over the City. A comprehensive list of all available plants here would result in a book…a discouraging book, because nearly every plant can present some kind of issue when planted out here. There are so many variables. The best that we can do is to go in with our ‘eyes open’ and minimize the mistakes that occur down the road. I love trees! I am most definitely not advocating that there are too many reasons to bother with them, though some homeowner/gardeners may. All living things age and can suffer injury along the way. These injuries can compromise them, just as they can us. This is not a reason to not plant. It is also not a reason to freak out and prune every branch and limb away from your house and risk compromising the strength and structure of the tree. This is a common mistake. I have always advocated removing such a tree over hacking it. Get a consult from a certified arborist. If the tree has already been compromised, if it is an inherently weak species, or has significant structural issues, it might be to your advantage to remove it now, before it collapses on your house in the middle of a storm. Otherwise treat your trees and shrubs respectfully and they will perform in your gardens and landscapes for a great many years to come. This is young Nyssa sylvatica, often known as Tupelo, planted along Trimet’s new Orange Line, to my thinking, for many reasons an ideal tree here. Normally it grows with a strong central leader, branches with broad angles of attachment that remain relatively small in diameter, is deciduous with strong/flexible wood and is relatively narrow given it’s height. Its beautiful full color, resistance to drought and heavy winter wet soils are a plus. I read the whole thing–aloud, to help me pay attention & comprehend. That’s a lot of terrific information. What you know is a lot. Thanks, Lance. Some people tell me I get to wordy, so I try to pare away the extra…then they tell me it’s too dense. Many people want everything in bullet points, but to me, that means paring away essentials. Bullet points are for memorization, not understanding. So I guess my goal is to challenge you, otherwise…what’s the point?